1. IN tIME Express Logistics s.r.o. 2. Šmídl Provozní Holding s.r.o. 5. O.K. Trans Praha spol. s r.o. 8. 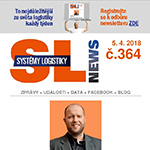 Raben Logistics Czech s.r.o. 12. TNT Express Worldwide, spol. s r.o. 15. ČSAD LOGISTIK Ostrava a.s.
17. EWALS CARGO CARE spol. s r.o. 18. LAGARDE SPEDITION spol. s r.o. 19. ČSAD Uherské Hradiště a.s.